I just can’t get enough of fresh summer peaches these days. 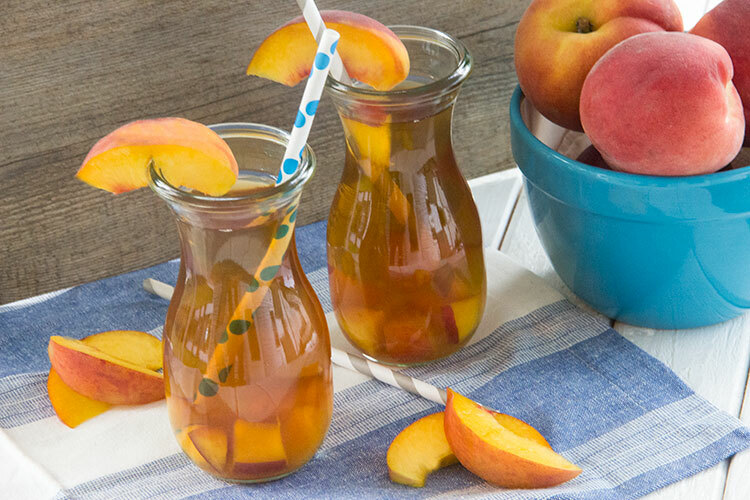 Right now, peaches are at the peak of their season, at the peak of their sweet and juicy flavor, and constantly on sale at the grocery store. So I’ve been snapping them up left and right and putting them in everything. Like this peach mango iced tea. I love peach tea, but I was looking at the ingredients in my favorite packaged brand. It’s made with things like: Peach Concentrate, Sucralose, Ascorbic Acid, Acesulfame Potassium. I try to eat fresh, whole foods and then drink that? So I tried a homemade version, and it really is delicious. 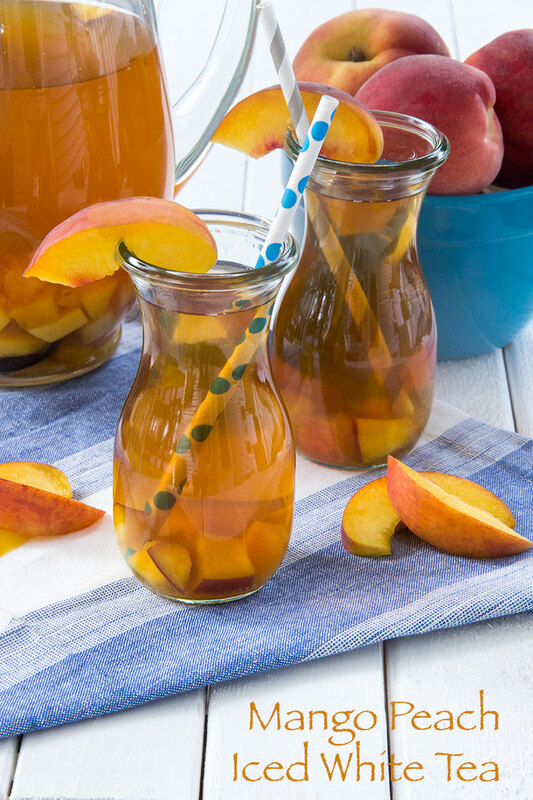 I find that adding fresh fruit to your iced tea adds that hint of flavor and sweetness, so you don’t feel the need to add tons of sugar or artificial sweetener. I’m a big fan of tea, but even Chris, who gets by in life without any caffeine (how is this possible!? ), loves this iced tea. the tonic for your mid-July, tired-of-plain-old-water thirst. This iced tea is light and really fresh tasting. The hint of sweet mango and peach is very nice with the white tea. It’s light, fresh, whole, and all-natural! Boil the 12 cups of water in a large saucepan or stock pot. Remove from the heat. Steep the white tea bags about 5 minutes, then discard tea bags. Transfer tea to a large mixing bowl. Allow the tea to sit until it cools to room temperature, about 45 minutes. Meanwhile, to a small mixing bowl, add the chopped peaches, thawed mango, and 1 tablespoon sugar. Allow the fruit to macerate, or sit until it’s softened and formed juices. 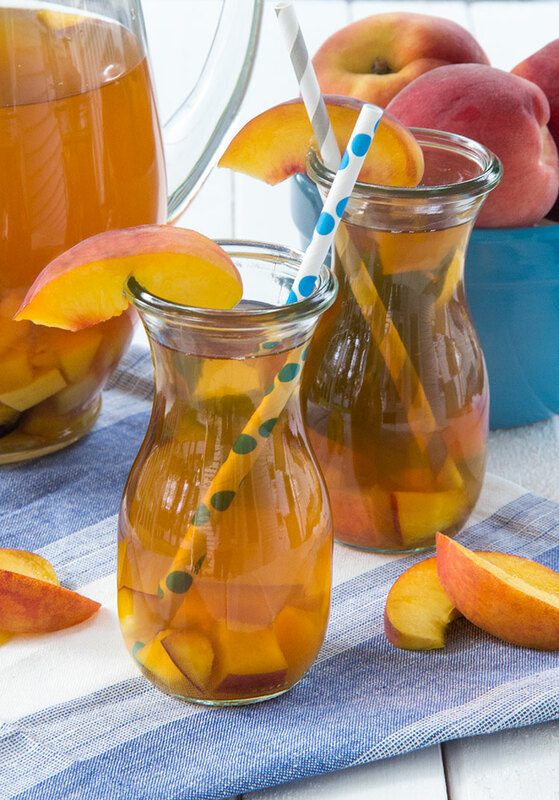 Transfer the fruit with juices to a large pitcher. Pour the cooled tea into the pitcher. Add 1/4 cup sugar. Using a large wooden spoon, stir to combine. Chill in the refrigerator and serve over ice. 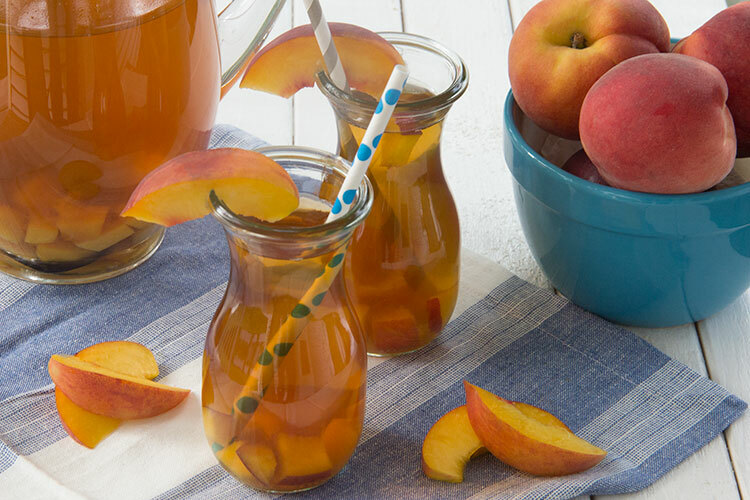 I’m not the biggest fan of tea, but I do like peaches, so maybe this would work for me! 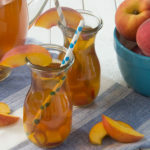 I love peach tea, this looks so refreshing! 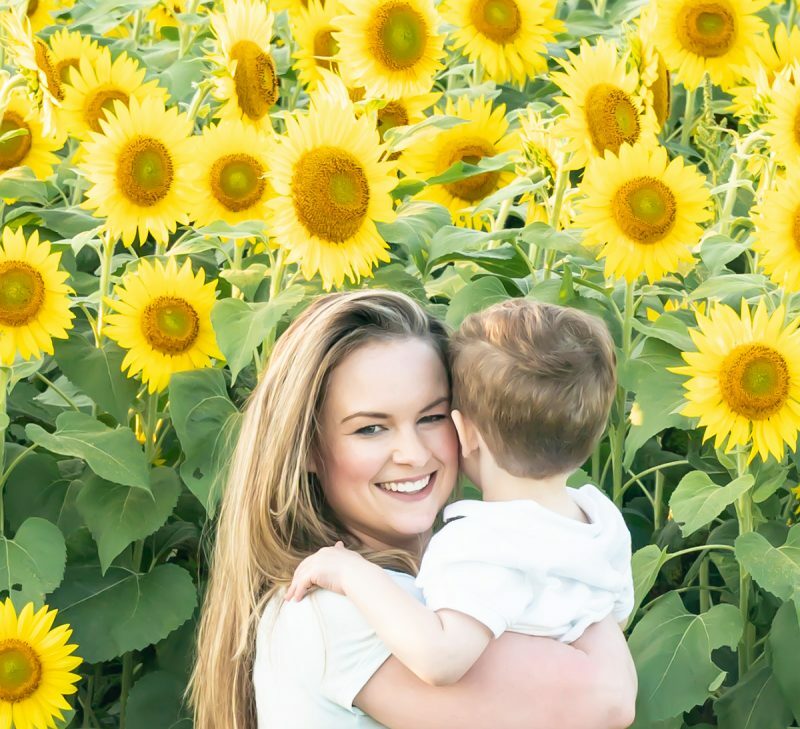 Pingback: Get inspired to throw a beautiful spring baby shower! Sounds yummy. Can’t wait to try it our pool side. I love this recipe. I love it with black tea also.